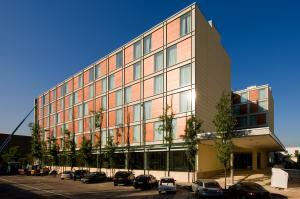 The Hotel is located in the business district (Viale Certosa) right between the two main trade fair venues and only 5 minutes away from the new Rho Fair Grounds.Throughout excellent connections with the major commercial areas, the hotel will be a key point for business exchange and convention meetings.This 6 floors hotel has an upscale design due to the use of materials such as glass and wood to ensure lightness to the internal areas while donating elegance to the outside appearance. This is thanks to the simple architectural lines that were chosen to make the hotel fit into the already existing town planning. Ideal for business clients will certainly be appreciated also by the leisure travellers.